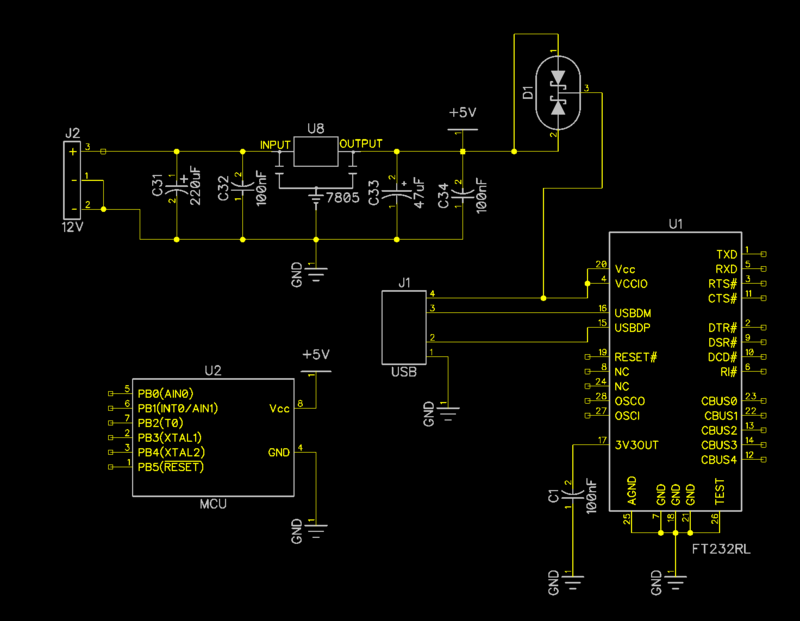 There are two power supply sources in the following diagram - USB and 12V. Only one power supply can be connected at the same time. I am trying to disable power to FT232 whenever 12V is plugged in. In that case FT232 should not be powered, but MCU will be powered. However, when USB is connected, both FT232 and MCU should be powered. I tried to use Schottky diodes(BAT54C) but I'm not sure if this is correct way. Also - would USB power harm voltage regulator in the second case? Connect output of U8 / capacitor C34 pin 2, to pin 1 of D1, connect J1 pin 4 (vcc) to D1 pin 2, and attach your +5V to D1 pin 3. This way the source with the highest voltage will supply your circuit.. The actual VCC will be Vin - drop voltage over D1 (0.3V usually), that is 4.7V in your example. But that is next to nothing..